The Ashworth is a North Myrtle Beach resort with an incredible sun deck. This oceanfront amenity at this North Myrtle Beach resort is well suited for all ages. It is full of water amenities and lounge chairs so you can sunbathe poolside, take a nap and read a book all while listening to the lulling sound of waves crashing onto the shore. Take a ride on the oceanfront lazy river at this sun deck. It has a curvy path that whirls past chaise lounges and palm trees. The swimming pool is wonderfully refreshing at this North Myrtle Beach resort and it is adjacent to an inviting sun deck. The smallest children in your family will likely be drawn to the kiddie pool at Ashworth. It has shallow water so they can safely splash and swim in a setting that is away from older kids and the adults. And there is a large hot tub at Ashworth where you might want to go after a day of shopping or playing 18 holes of Myrtle Beach golf. This North Myrtle Beach resort also boasts an indoor swimming pool for those afternoons when you want a short break from the sunshine. There is an oceanfront lawn at Ashworth and a handful of picnic tables and grills encourage you to have a barbecue outside during your North Myrtle Beach vacation. When you spend your beach vacation at Ashworth you will also have access to a fitness center. It is nice to have cardio equipment and exercise machines at your fingertips when you vacation in a seaside location that has a wide variety of rich, delicious seafood and fantastic desserts. You may discover that you have a need to burn off some of those extra calories and an on-site fitness room is just the way to accomplish that during your North Myrtle Beach vacation at Ashworth. 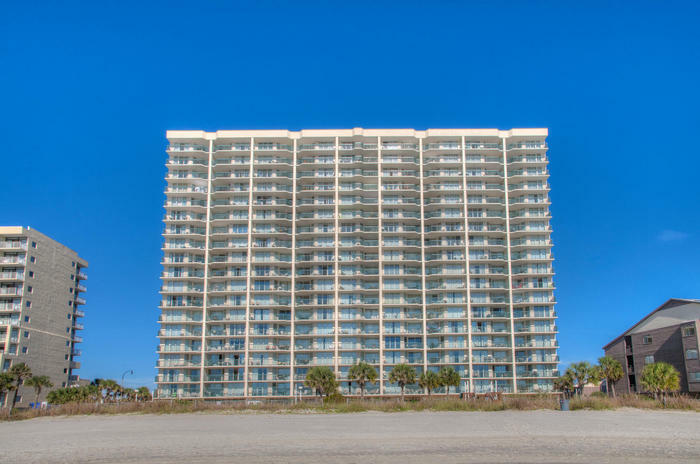 Make reservations today for a North Myrtle Beach vacation rental at Ashworth on the oceanfront and come on to the beach. There is a seven-level parking garage attached to this North Myrtle Beach resort so you can quickly and easily reach the front door of your North Myrtle Beach rental. There is so much more to a North Myrtle Beach vacation than a beautifully inviting swimming pool and a long stretch of gorgeous beachfront. In North Myrtle Beach, SC there are amusements and attractions galore. Shopping alone can consume every day of a North Myrtle Beach vacation. With more than 100 golf courses in the area you can easily spend every day of your North Myrtle Beach vacation on a golf course or two. Take time to explore all the fun that is in store for your family in the North Myrtle Beach and Myrtle Beach area and make the most of your vacation at Ashworth. This North Myrtle Beach resort is centrally located to championship golf courses designed by some of your favorite golf architects. Driving ranges, professional lessons and clinics, club houses with a pro shop and a cigar lounge and practice putting greens that give you the opportunity to improve your game are all part of the North Myrtle Beach golf experience. Shopping in the North Myrtle Beach area can include bargain hunting at outlet malls, discovering one-of-a-kind treasures at consignment and antique shops, and finding the perfect outfit, home decoration and gift item at one of the area’s most popular shopping destinations. Grab some lunch at a waterfront restaurant during your shopping spree and take a break long enough to enjoy a tropical beverage while listening to live music at a North Myrtle Beach bar during your shopping day. Live entertainment theatres are another popular aspect to a memorable North Myrtle Beach vacation. Singing, dancing, comedy and even live animals get in on the acts that make this area’s selection of live entertainment theatres impressive. The Carolina Opry, Alabama Theatre, Pirates Voyage, House of Blues and Palace Theatre are closely located to Ashworth so check out the calendars of events at each theatre and get tickets as soon as you can.